Late last week, Eric and I had a few neighbours over for dinner. One of our guests is set to depart shortly for a year-long adventure. We took this timely opportunity to chat, laugh, eat, drink and mostly enjoy each other’s company. The evening began with the Friend of a Friend signature cocktail and finished with port-sized glasses of Southbrook’s award-winning Canadian Framboise dessert wine paired with a fresh baked cherry clafouti. Stay tuned for details of the duck breast entrée and highlights of the soirée! I am visiting my parents back in Ontario for a week and have an opportunity to reflect on my culinary roots and how I was influenced to develop into the fearless person I am today. We certainly did not grow up in a gourmet world, often surrounded by comfort food and efficient dishes to feed a family of six: Shepherd’s pie, moose stews, meat pies, pots of steamy soup, chicken hearts and gizzards followed by loads of apple or jellied desserts. I believed the Impossible pie was something unique and delightfully ‘unrefined’ as no one else had ever made or had it other than our family. 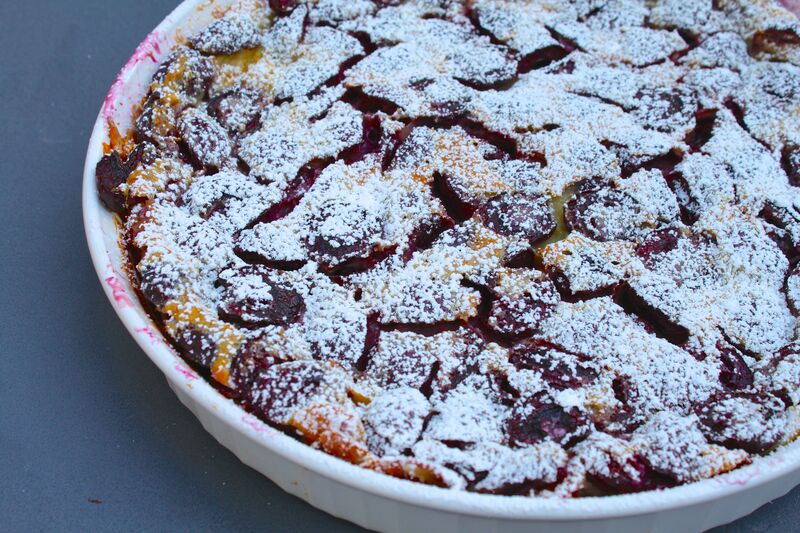 In my fearless exploring of culinary dishes, I stumbled upon a standard and traditional French custard dessert – the clafouti, described as a baked dessert where fruit (typically black cherries) are covered with a thick flan-like batter, dusted with powdered sugar and served lukewarm. 1. Preheat oven to 375°. Butter cake pan or ramekins. Arrange cherries in a single layer in pan. 2. Combine milk and cream in a small saucepan; bring just to a simmer over medium heat. Set aside. Combine eggs, flour, sugar, lemon zest, vanilla, and salt in a medium bowl; whisk to blend. Gradually whisk in hot milk mixture; whisk until custard is smooth. Pour custard evenly over cherries in pan. If necessary, gently shake pan to allow custard to settle. 3. Bake clafouti until custard is set and top is golden brown, about 30 minutes for ramekins and 45-55 minutes for cake pan. Let cool 3 minutes, then run a knife around pan sides to loosen clafouti (if using a cake pan). Dust top with powdered sugar; cut into wedges and serve.